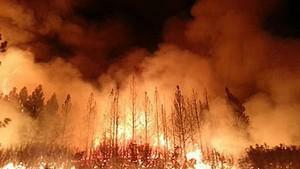 Climate change and negligent forest management are causing higher-intensity, faster-moving fires that can generate enough energy to evolve into erratic firestorms, known as pyroCbs, in the face of which first responders can do little. “Traditionally we could predict the fire behavior and the direction of the fire but under those conditions and those moments it’s not possible,” said Marc Castellnou, president of the Spanish independent wildfire prevention group Pau Costa Foundation. While these fires are rare, when one strikes it can generate 100,000 kilowatts of energy per meter. In firefighting terms, this is ten times what a firefighter can handle, but even at 4,000 kilowatts, firefighters cannot go near the flames and require aerial support. ”The old way of fighting fires by sending firefighters – that’s gone,” Castellnou said. “This change has been cooking for a long time, but the first time we realized something wrong was happening were the years 2009 and 2012,” he said, referring to the Black Saturday bushfires in the Australian state of Victoria that killed 173 people and wildfires in Spain, Portugal, Chile and California, US. Many in the fire community initially thought these were just abnormal events, he says. “What I saw was the pace of the fires … You think: “Well that cannot be real.” When you go there (and see the damage) you understand that that is the reality,” he said.